Spoil the kids rotten – these stores are your one-stop shops for all the toys they could ever need. Age 2 or 82 – Hamley’s is always a blast to visit. They even let you go crazy playing with the toys before buying one. Probably the biggest collection of premium and expensive toys, you’ll get everything from giant stuffed teddy bears (we’re talking bigger than life-size! ), telescopes and detective toys, limited edition footballs and cars controlled by actual steering wheels. They’ll even wrap the present in signature Hamley’s wrapping paper for you for free! Established way back in 1919 (it’s almost 100 years old! ), you can find what is probably the oldest toy store in Kolkata in store D 67/ 68 in New Market. Yes, we see the irony that it’s called ‘Modern Toys’. Dolls, cars, blocks, puzzles, books, educational toys, both branded and not, are available in plenty. There’s no doubt the kids will drag you in here if you’re in Forum, they can’t seem to resist the bright lights and stacked toys. We love their collection of puzzles and toys for the little-est ones. They’re also stocked up on school supplies and you’ll get a good selection of school bags to chose from – they have colourful cartoon and Disney ones which are uber cute. Plus, they have a giant Mario figure if any ‘90s kids want to treat themselves. One of the oldest standalone toy stores in the city, Gariahat’s Wonderland Toys is a brightly lit store that is vibrant, colourful and choc-a-block with toys (no, seriously, it’s so full you’re always concerned about knocking something over). You get the branded quality products as well as non-branded local toys – you’ll find something for every budget. Besides the regular toys and games, you also get stationary and playground equipment. Beware: Puja season means intense crowds! Starmark is toy paradise for the kids in the city. Apart from the regular stuff, we love their Lego and car collections. They sometimes stock the Lego City series (not commonly found in the city) with different parts like the fire station, airplane, skyscrapers – which you collect to complete the model. The USP for the store is definitely that you get toys for every age group – right from infants to fully grown adults (we know you’re dying to get your hands on the limited-edition Monopoly set). You’ll find this popular local store in Shyambazaar opposite Talkie Show House Cinema Hall. If you’re looking to stock up on affordable generic toys particularly. 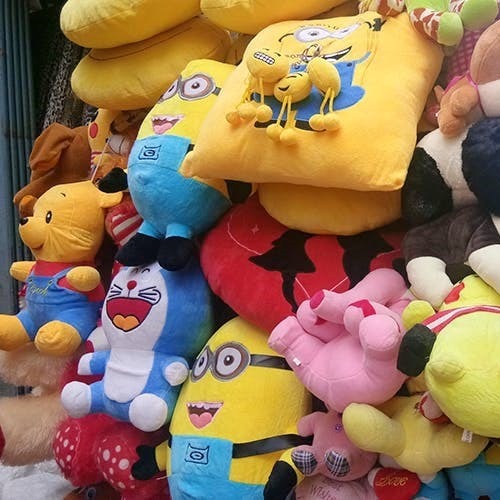 Stuffed toys, dolls and cars are available in huge variety. You also get tiny bikes and miniature cars for the kids to ride around in. It tends to get pretty hot and sticky so you may want to avoid it on humid days.